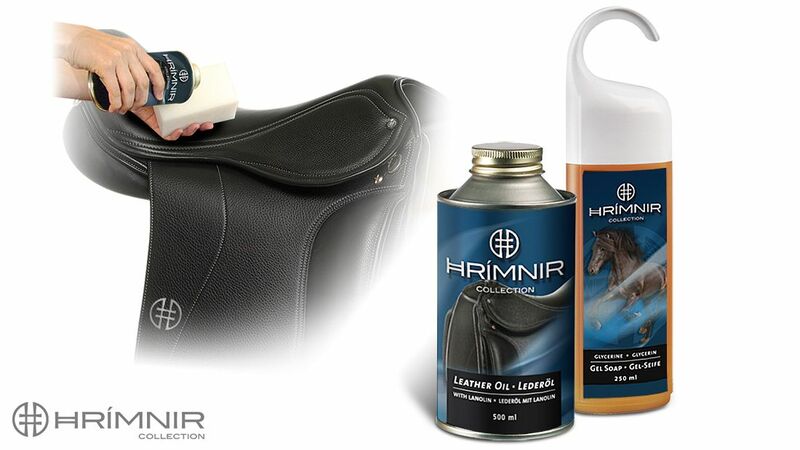 We recommend oiling your new saddle before first use with a high quality leather oil. To avoid rubbing the finish off or scratching the grain of the leather of a new saddle, do not ride in the saddle until it has been properly oiled. The purpose of oiling the saddle before use is for comfort and prevention of wear and tear, rather than to achieve a deeper coloration. With a soft brush or a sponge, generously spread a thin coat of warm (not hot) leather oil over all parts of the saddle, top and bottom. Don’t forget the billets and billet guard. However, do not soak the seat, kneepads, panels and billets with oil. Let the oil penetrate for 24 hours, leaving the saddle in a dry place. Then carefully remove the excess oil by buffing with a soft cloth. Do not forget to lightly oil your stirrup leathers, because dry stirrup leathers are very abrasive and might damage the grain of the saddle leather. We purposely chose to use only natural leather for our saddles. We rejected a chemical process that turns leather more resistant against environmental influences because it also makes it harder and stiff. Instead, we chose eco-friendly, naturally processed leather to achieve unique softness, flexibility, high comfort, and an elegant look. We care about that naturally processed leather is better for the environment and your health. However, natural leather requires good care and correct use in order to remain at its best. Even high quality leather needs regular cleaning and care to keep it soft, and to protect it from environmental damage. Exposure to water, dirt, sweat, or a lot of sunshine puts extra stress on leather and makes it dry, brittle, and pale. All of our riding equipment is made of the finest leather, and we highly recommend cleaning and oiling it regularly, and especially after exposure to environmental damage. The more extreme the situation of your ride, the better care you need to take of your riding equipment. Your high quality leather tack will not stay soft and rich in color without proper care and use. We recommend daily cleaning of your leather tack with glycerine saddle soap and a damp sponge. Additionally, a thin layer of high quality leather oil should be applied from time to time. The frequency and quantity of leather oil depends on the use and environmental damage to the tack. Protect your investment by making sure the leather stays soft and rich in color. You should only use a small amount of leather oil on pieces or straps that are load-bearing, for example stirrup leathers or reins. The storage of your saddle will greatly influence its condition. We recommend storing your saddle under the saddle cover on a supportive saddle rack instead of a single pole. The girth should lie across the saddle and not hang attached to the billets on one side. The saddle should be kept in a dark and dry room or saddle closet where it is not exposed to sunlight or other environmental damage. If the saddle becomes wet during use, it should always be dried off with a soft towel before storage in order to avoid water stains. Avoid putting your saddle on the floor, even for short storage, and always use a saddle cover when travelling with your saddle.